AIR EMERGENCY RESPONSE 42 June/July 2018 unmanned systems inside Photos courtesy of Jarrett Broder. other obstacles can slow you down, making it dif- ficult to get from point A to point B. Water, food, batteries, gas and power aren't readily available, so responders have to be self-sufficient. Then of course there are the people who are affected by the disaster. Maybe they've lost their home to flooding or can't find a loved one. 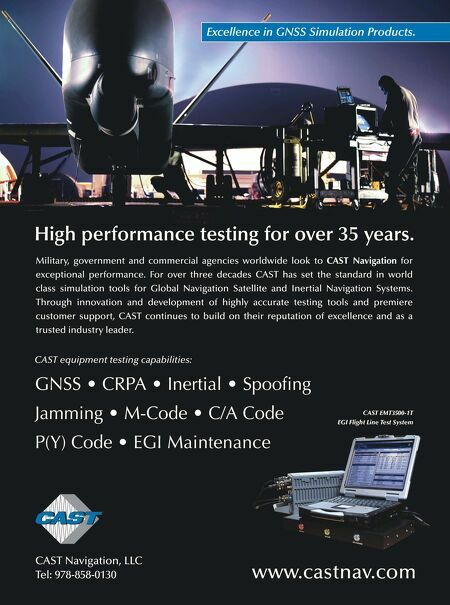 Drone opera- tors have to know how to communicate with the victims, and to always respect their privacy. That comes from proper training, Hendrix said. Todd, whose team was hired by an energy company to help with damage assessment and to provide images for marketing, said it's important to know storm victims are stressed and overwhelmed, and they all react in differ- ent ways. Drone operators have to be prepared for that, staying professional and helping however they can, which could mean offering someone a bottle of water or a snack. "There's going to be a lot of curiosity from the public. If you're f lying a mission for a power company and they've been without power for days, they want answers. If they see a drone pi- lot wearing a yellow vest and a hard hat, they're going to start asking questions," Todd said. "We don't have the answers but we have to be empathetic. We represent the first semblance of hope they've seen since the storm." 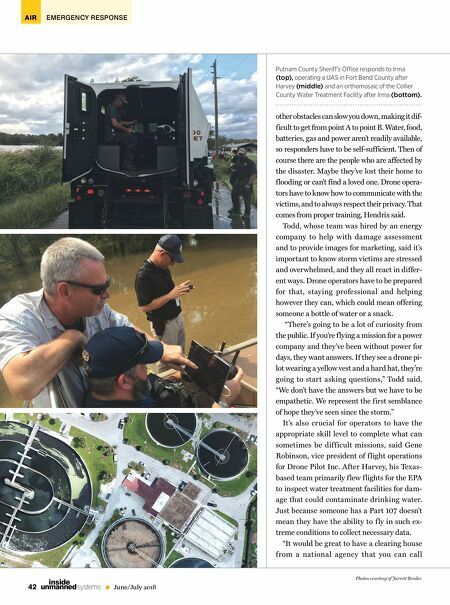 It's also crucial for operators to have the appropriate skill level to complete what can sometimes be difficult missions, said Gene Robinson, vice president of f light operations for Drone Pilot Inc. After Harvey, his Texas- based team primarily f lew f lights for the EPA to inspect water treatment facilities for dam- age that could contaminate drinking water. Just because someone has a Part 107 doesn't mean they have the ability to f ly in such ex- treme conditions to collect necessary data. "It would be great to have a clearing house from a national agency that you can call Putnam County Sheriff's Office responds to Irma (top), operating a UAS in Fort Bend County after Harvey (middle) and an orthomosaic of the Collier County Water Treatment Facility after Irma (bottom).